People are now taking an average of two or three holidays a year. 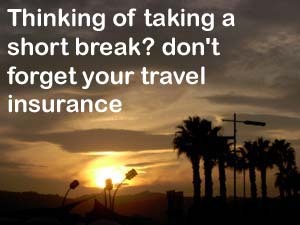 Whether this is a two week break in Spain plus a weekend break on the Isle of Wight, you still need to take out travel insurance. Holiday delayed? Missed departure? Lost your passport? Personal money stolen? Are just some of the reasons to do this? We have a selection of products advertised by insurance companies covering travel insurance and winter sports.